Besides practices and games, how does a young soccer athlete improve their skills on the ball and increase their awareness about the game of soccer? First, we start with balance. Most of the time, you can find these young soccer enthusiasts falling over the ball or even a rough patch of grass on the pitch. They seem to fall a few times a game and some fall more than that. Are they clumsy? Will they grow out it? As their bodies are growing, their minds are changing also and attempting to relay the new messages to their developing musculoskeletal system. Incorporating fun balance drills into the soccer practices or at home can go a long way and be fun for the athletes to do. 1) Start off with a walk down a chalk line on the field or sidewalk making sure that both feet land on the line on each step. Then run on the line making sure both feet always land on the line. 2) Balance on one leg on the chalk line for 10 seconds each leg with their eyes open. To make it more difficult, balance longer leading to 20 seconds or have them close their eyes. 3) Balance on one foot and throw the soccer ball at them to catch. Having them catch the soccer ball improves their coordination. Second, incorporate the balance into agility drills. 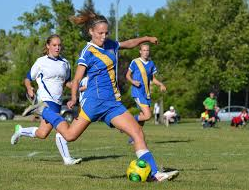 The young soccer athletes need to be quicker on their feet so they can learn to keep their stability when they get the ball or come into a tackle with another player. Having quicker feet will not only allow them to move faster on the field but it will help them to avoid dangerous situations where they could get hurt. 4) Hop on both feet forward and backwards over the chalk line for 15 – 20 seconds. Then, switch to hopping over the line in a side-to-side direction. 5) Progress to using the feet separately to switch across the chalk line in forward/backward and side-to-side directions. 6) Advanced exercises include doing the drills while throwing the soccer ball at them to catch or putting up a number of fingers on your hand that they have to say out loud. 7) Now merge the agility onto the ball using skill drills such as: tip/taps, bells, step-overs, and scissors. There are an infinite number of exercises that the youth athletes could do to work on their balance, agility, and have fun. Using the soccer ball is always fun for the athletes but you could also use cones, chalk lines, and hurdles to make the drills different.